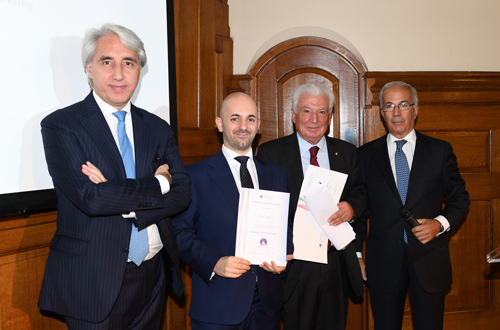 Congratulations to Cass Senior Lecturer in Strategy and Full Time MBA Course Director, Dr Paolo Aversa, who has won a prestigious Talented Young Italian Award, awarded by the Italian Chamber of Commerce and Industry for the UK. The award specifically focuses on “young Italians” (under 40 years old) that have achieved important professional results in the UK but also have continued to contribute their home country. For me this dual commitment has always been a very important aspect to which I dedicated time and energy, so I am particularly happy about this acknowledgement. I am grateful to the United Kingdom and particularly to Cass and City for giving me the opportunity to professionally thrive, but I am also grateful to Italy for providing me an exceptional education at a very reasonable cost, and a system of support which included scholarships, mentorships, and grants to move the first steps towards an international academic career. He received the award in the ‘Research and Innovation’ category, and the award does not focus on a specific piece of research but on his entire career trajectory and his related achievements in education and the impact on the industry and policy makers in his field as a strategy scholar. As a strategy scholar I specifically investigate the relationship between firm innovation and performance in changing contingencies. During the award ceremony the committee mentioned my research on Formula 1 as a key distinctive (and innovative) feature of my research profile, and mentioned how my studies have informed executives and policy makers on what are the best strategies in terms of technological and business model innovation during turbulent times—a topic which is quite timely given the current international turmoil and the repercussion on the markets. Dr Aversa said his time at Cass has helped him along this journey by providing resources, including research grants, and conditions to develop his profile. Cass is an intellectual stimulating environment where senior scholars are often available to support more junior people, and where co-authorship is encouraged. Cass also embraces teaching innovation, and I have always found open doors when I promoted new ideas. Starting with 2017 the School has given me the opportunity and privilege to serve as director of the Full-Time MBA, one of our flagship programmes, where the faculty and staff managed to achieve important result, such as being ranked #1 globally for Corporate Strategy (in 2017) and #5 globally for entrepreneurship (in 2018). These results collectively contributed to my inclusion the ‘Poets and Quants’ 'Best 40 under 40 Professors', which was also mentioned at the award. The Talented Young Italian Awards is in its fifth year, and covered categories including media and communication, finance and services, research and innovation and industry and commerce. The other category winners under research and innovation were Anna Sergi, Senior Lecturer in Criminology at the University of Essex, and Marco Endrizzi, a Royal Academy of Engineering Research Fellow. I was truly humbled by receiving this award, and as some friends made me notice I should be even happier since the award it’s for 'young' people—I did not know I can still consider myself 'young'—it’s the most flattering part of the award! I’d like to thank the Italian Chamber of Commerce and Industry in the UK and H.E Raffaele Trombetta, the Italian Ambassador, for the award, as well as my family, Cass and my colleagues, Italy and UK for their continuous support.